A fleuron is a typographic element, or glyph, used either as a punctuation mark or as an ornament for typographic compositions. Fleurons are stylized forms of flowers or leaves; the term derives from the Old French word floron, for flower. Robert Bringhurst in The Elements of Typographic Style calls the forms "horticultural dingbats." It is also known as a printers' flower, or more formally as an aldus leaf (after Italian Renaissance printer Aldus Manutius), hedera leaf ("ivy leaf"), or simply hedera symbol. One of the oldest typographic ornaments, in early Greek and Latin texts, the hedera was used as an inline character to divide paragraphs, similarly to the pilcrow. It can also be used to fill the white space that result from the indentation of the first line of a paragraph, on a line by itself to divide paragraphs in a highly stylized way, to divide lists, or for pure ornamentation. In more modern historic books, line breaks became more common as paragraph dividers, and fleurons became popular to create ornamented borders. Fleurons were crafted the same way as other typographic elements were: as individual metal sorts that could be fit into the printer's compositions alongside letter and numbers. This saved the printer time and effort in producing ornamentation. Because the sorts could be produced in multiples, printers could build up borders with repeating patterns of fleurons. The fleuron is also used in some take-out menus in red (resembling a chilli) to denote a dish that is particularly spicy. Twenty-four fleurons originally found in the Wingdings and Wingdings 2 fonts have been included in Unicode 7.0 under its new Ornamental Dingbats block. IM Fell Flowers, an open-source release of the Fell Types preserving the irregularities of the original 17th-century designs. 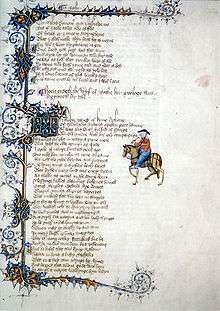 Early printers sought to use fleurons to replicate the style of manuscripts like this one. Specimens of printed floral borders from an 1897 type foundry specimen book. Example fleuron glyphs from a digital font. ↑ "Fleuron | Define Fleuron at Dictionary.com". Dictionary.reference.com. Retrieved 2013-12-24. ↑ "History of Graphic Design: Rare Books Collection: The Pilcrow". Mikemichelleapril.blogspot.com. 2008-09-29. Retrieved 2013-12-24. ↑ "Typographic Marks Unknown - @retinart". Retinart.net. Retrieved 2013-12-24. ↑ Archived October 29, 2013, at the Wayback Machine. ↑ "Hoefler Text Font Features: Special Characters | H&FJ". Typography.com. Retrieved 2013-12-24. ↑ "Download". Linotype.com. Retrieved 2013-12-24. ↑ Marini, Igino. "Fell Types". Retrieved 1 December 2014. ↑ "LTC Fleurons Granjon". P22.com. Retrieved 2013-12-24. ↑ "Lanston Font | Printers Fleurons C | Printers Borders". P22.com. Retrieved 2013-12-24. ↑ "Requiem Font Features: Ornaments | H&FJ". Typography.com. Retrieved 2013-12-24. ↑ "Fonts and Type Design - Rieven Uncial, A typeface designed by Steven Skaggs". Delve Fonts. Retrieved 2013-12-24. Wikimedia Commons has media related to Fleuron and Aldus leaf.